David Bowie The Man Who Sold the World is the third studio album by David Bowie, originally released on Mercury Records in November 1970 in the US, and in April 1971 in the UK. 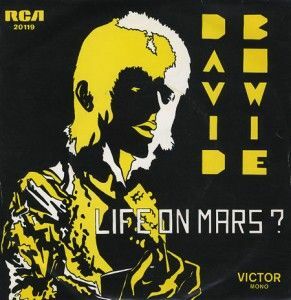 The album was Bowie’s first with the nucleus of what would become the “Spiders from Mars”, the backing band made famous by The Rise and Fall of Ziggy Stardust and the Spiders from Mars in 1972. Though author David Buckley has described Bowie’s previous record David Bowie (Space Oddity) as “the first Bowie album proper”, NME critics Roy Carr and Charles Shaar Murray have said of The Man Who Sold the World, “this is where the story really starts”. Departing from the folk music of Bowie’s debut album, The Man Who Sold the World is a hard rock and heavy metal album It has been claimed that this album’s release marks the birth of glam rock[by whom? The album was written and rehearsed at David Bowie’s home in Haddon Hall, Beckenham, an Edwardian mansion converted to a block of flats that was described by one visitor as having an ambience “like Dracula’s living room”. As Bowie was preoccupied with his new wife Angie at the time, the music was largely arranged by guitarist Mick Ronson and bassist/producer Tony Visconti. 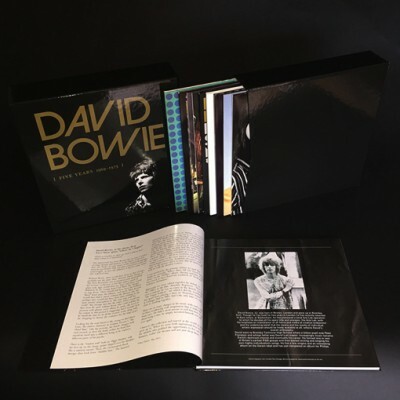 Although Bowie is officially credited as the composer of all music on the album, biographers such as Peter Doggett have marshaled evidence to the contrary, quoting Visconti saying “the songs were written by all four of us. We’d jam in a basement, and Bowie would just say whether he liked them or not.” In Doggett’s narrative, “The band (sometimes with Bowie contributing guitar, sometimes not) would record an instrumental track, which might or might not be based upon an original Bowie idea. 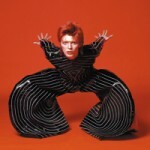 Then, at the last possible moment, Bowie would reluctantly uncurl himself from the sofa on which he was lounging with his wife, and dash off a set of lyrics.” Despite his exasperation with the singer’s preoccupation with married life, Visconti would later rate The Man Who Sold the World his best work with Bowie until 1980s Scary Monsters (and Super Creeps). Although Bowie is quoted in an interview in 1998 as saying “I really did object to the impression that I did not write the songs on The Man Who Sold the World. You only have to check out the chord changes. No-one writes chord changes like that.” “The Width of a Circle” and “The Supermen” were already in existence to name two before the sessions began. Much of the album had a distinct heavy metal edge that distinguishes it from Bowie’s other releases, and has been compared to contemporary acts such as Led Zeppelin and Black Sabbath. The record also provided some unusual musical detours, such as the title track’s use of Latin rhythms to hold the melody. [ The sonic heaviness of the album was matched by the subject matter, which included insanity (“All the Madmen”), gun-toting assassins and Vietnam War commentary (“Running Gun Blues”), an omniscient computer (“Saviour Machine”), and Lovecraftian Elder Gods (“The Supermen”).The song “She Shook Me Cold” was an explanation of a heterosexual encounter. The album has also been seen as reflecting the influence of such figures as Aleister Crowley, Franz Kafka and Friedrich Nietzsche. 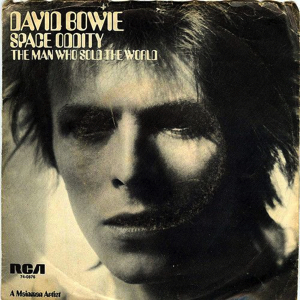 The original 1970 US release of The Man Who Sold the World employed a cartoon-like cover drawing by Bowie’s friend Michael J. Weller, featuring a cowboy in front of the Cane Hill mental asylum.The first UK cover, on which Bowie is seen reclining in a Mr Fish “man’s dress”, was an early indication of his interest in exploiting his androgynous appearance. The dress was designed by British fashion designer Michael Fish, and Bowie also used it in February 1971 on his first promotional tour to the United States, where he wore it during interviews despite the fact that the Americans had no knowledge of the as yet unreleased UK cover. It has been said that his “bleached blond locks, falling below shoulder level”, were inspired by a Pre-Raphaelite painting by Dante Gabriel Rossetti. The 1971 German release presented a winged hybrid creature with Bowie’s head and a hand for a body, preparing to flick the Earth away. The 1972 worldwide reissue by RCA Records used a black-and-white picture of Ziggy Stardust on the sleeve which remained until 1990 when the Rykodisc reissue reinstated the original UK “dress” cover. It also appeared on the 1999 EMI remaster. None of the songs were released to the public as singles at the time, though a promo version of “All the Madmen” was issued in the US in 1971. 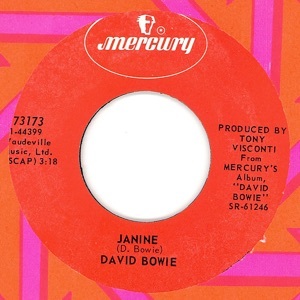 Although stock copies have apparently never turned up, according to Michel Ruppli & Ed Novitsky’s The Mercury Labels (Greenwood Press, 1993) “Janine” from the previous album was intended as the B-side of the edited “All The Madmen” single (Mercury 73173). The same song appeared in Eastern Europe in 1973, as did “The Width of a Circle”. “Black Country Rock” was released as the B-side of “Holy Holy” in the UK in January 1971, shortly before the album. 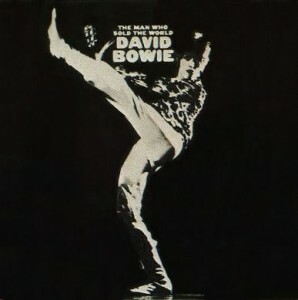 The title track appeared as the B-side of both the US single release of “Space Oddity” in 1972 and the UK release of “Life on Mars?” in 1973; it also provided an unlikely hit for Scottish pop singer Lulu (produced by Bowie and Ronson) and would be covered by many artists over the years, including Richard Barone in 1987, and Nirvana in 1993, who performed a cover of “The Man Who Sold the World” for Unplugged in New York. The Man Who Sold the World was generally more successful commercially and critically in the US than in the UK on its original release in 1970–71. Music publications Melody Maker and NME found it “surprisingly excellent” and “rather hysterical”, respectively.John Mendelsohn of Rolling Stone called the album “uniformly excellent” and commented that producer Tony Visconti’s “use of echo, phasing, and other techniques on Bowie’s voice […] serves to reinforce the jaggedness of Bowie’s words and music”, which he interpreted as “oblique and fragmented images that are almost impenetrable separately but which convey with effectiveness an ironic and bitter sense of the world when considered together”.Sales were not high enough to dent the charts in either country at the time, however it made No. 26 in the UK and No. 105 in the US following its re-release on 25 November 1972, in the wake of Bowie’s commercial breakthrough The Rise and Fall of Ziggy Stardust and the Spiders from Mars. The album has been cited as influencing the goth rock, darkwave and science fiction elements of work by artists such as Siouxsie and the Banshees, The Cure, Gary Numan, John Foxx and Nine Inch Nails. In his journal, Kurt Cobain of Nirvana listed it at number 45 in his top 50 favourite albums. In 1993, the band re-recorded its title-track in their MTV Unplugged in New York. It has been claimed that glam rock began with the release of this album, though this is also attributed to Marc Bolan’s appearance on the UK TV programme Top of the Pops in December 1970 wearing glitter, to perform what would be his first UK hit single under the name T. Rex, “Ride a White Swan”, which peaked at Number 2 in the UK chart. In a retrospective review, Allmusic editor Stephen Thomas Erlewine cited the album as “the beginning of David Bowie’s classic period” and complimented its “tight, twisted heavy guitar rock that appears simple on the surface but sounds more gnarled upon each listen”. Erlewine viewed its music and Bowie’s “paranoid futuristic tales” as “bizarre”, adding that “Musically, there isn’t much innovation […] it is almost all hard blues-rock or psychedelic folk-rock – but there’s an unsettling edge to the band’s performance, which makes the record one of Bowie’s best albums”. In a 1999 review upon the album’s reissue, Q gave it three out of five stars and called it “a robust, sexually charged affair”. Mojo stated in a 2002 review, “A robust set that spins with dizzying disorientation […] Bowie’s armoury was being hastily assembled, though it was never deployed with such thrilling abandon again”. The Man Who Sold the World was first released on CD by RCA in 1984. The German (RCA PD84654, for the European Market) and Japanese (RCA PCD1-4816, for the US market) masters were sourced from different tapes and are not identical for each region. The album was reissued by Rykodisc (RCD 10132)/EMI (CDP 79 1837 2) on 30 January 1990 with an extended track listing including a 1971 rerecording of “Holy Holy”, incorrectly described in the liner notes as the original 1970 single version. 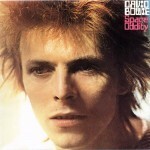 Bowie vetoed inclusion of the earlier recording, which is available only on the bootleg album Changesthreeandahalf. Rykodisc later released this album in the AU20 series (RCD 80132) with 24-bit digitally remastered sound. In 1999, the album was reissued again by Virgin/EMI (7243 521901 0 2), without the bonus tracks but with 24-bit digitally remastered sound. The Japanese mini LP (EMI TOCP-70142) replicates the cover and texture of the original Mercury LP.